Attached is a screen shot from a test markscheme I obtained from school. It asks us to quantify the bond angle which is fine, but I cannot understand the language used to refer to the bond being spoken of. I understand that term now, but I still don't get the first sentence and which atoms are being referred to. I can't open the file, it says I don't have permission :/. But what they mean by in plane and out of of plane is, well they're trying to explain the shape of your molecule that is 3D, but in 2D. Out of the plane just means it's out of the 2-d plane, and you have to imagine it in 3D. Hard to explain.. hope this helped. Sorry, it's the whole VIPs allowed to view files only! 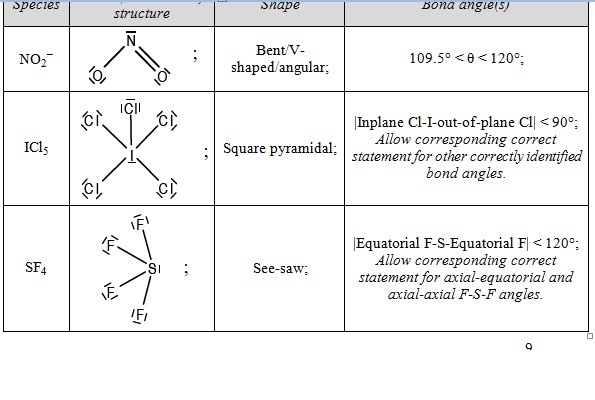 It just means the bond angle of Cl-I-Cl and F-S-F.